I came across with this video which explains perfectly the idea of the circular economy. We have come to a point that when something is broken we just throw it to the rubbish and we buy a new one as much as in electrical appliances as in clothing. 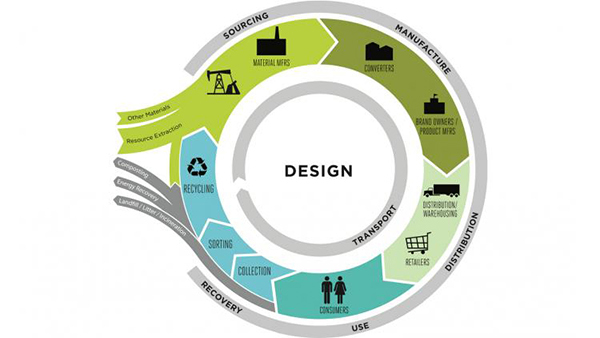 In a circular economy, the aim for durable components, such as metals and most plastics, is to reuse them for other productive applications through as many cycles as possible. 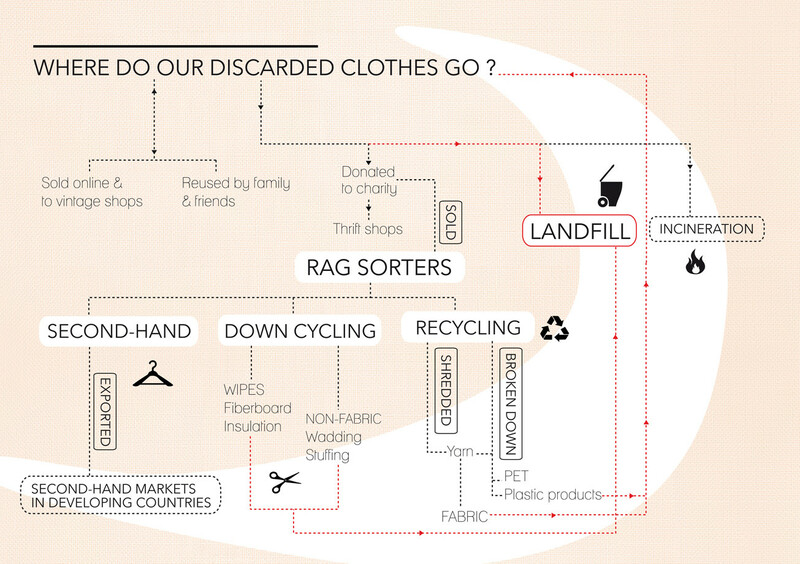 In this diagram Posted byMagali An Berthon on December 20, 2016 in Cooper Hewitt online magazine we can see where does our clothes go at the end of their cycle. There are 3 main points where our clothes go and it could be second hand shops, mainly in developing countries; down cycling that means rehuse for insulation or stuffing mainly in construction. Recycling will be the last one when the garment is unable to be used again but still you can recover the fibre and create new yarns. This would be m ore viable than recycling in the long run, it would increase the attractiveness of currently unattractive ranks of used textiles. According to a textiles market situation report in Europe, WRAP is leading the European Clothing Action Plan, which includes an objective specically around recycling, to “enlarge market share of recycled textile materials in new clothes and fashion”. The plan includes a goal to have clothes with recycled content in the shops by 2018. In a report from the European Commission, there is a new initiative also taken by WRAP and it’s to tackle the growing clothing and textiles waste issue across Europe. The idea is to reduce over 90,000 tonnes of textiles away from landfill by 2019. Eleven countries have signed up to this plan so far. These are: Denmark, Finland, UK, Germany, Italy, Netherlands, Norway, Poland, Romania, Spain and Sweden. Looks like we are moving towards a more sustainable future? Will you be able to just repair instead of buying new items? Would you still buy compulsively clothes every season knowing how damaging is once you don’t want them anymore? There is a lot of questions that we should do to ourselves before taking this step. Every little step that we can do is important. Have a wonderful week!